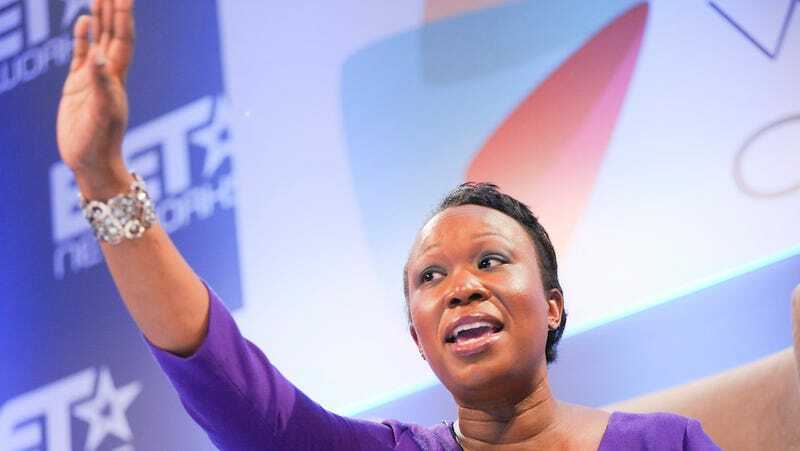 The cable news network announced on Monday that it was adding Joy-Ann Reid permanently to its programming schedule. Reid joins Melissa Harris-Perry, Al Sharpton, Karen Finney, Tamron Hall, Touré, and Craig Melvin as the network's seventh African American host. She's also MSNBC's 12th female anchor. "Joy Reid has been the managing editor of TheGrio.com and MSNBC contributor since July 2011. She's also been a frequent substitute host on MSNBC during all dayparts. Reid is a political columnist for 'The Miami Herald' and editor of the politics blog The Reid Report. Reid has worked in television and radio news since 1998 and her columns have appeared in a variety of outlets including Salon.com." Reid, who will take the network's 2 PM time slot, also filled in during the 4 PM hour late last year, after Martin Bashir resigned amid remarks he made about Sarah Palin. Viewers were upset after that slot went permanently to Alex Wagner. Reid's appointment not only rectifies that controversy, but reflects the network's engagement with AfricanAmerican viewers. As of December 2013, MSNBC prime time ranked first among this demographic in total viewers. In addition, From 6 - 2 AM, 30 percent of MSNBC's 25-54 audience was African American, and 7 percent was Hispanic. NBCUniversal also owns The Grio, and announced a new managing editor for the site after Reid's permanent appointment to MSNBC.